Do you have your little ones Birthday Party coming up? Confused where to get your party supplies from? PartyBell.com brings you collection of Theme based Party Kits. Most of us get annoyed trying to look for our Theme based Party Supplies be it tableware, decorations or anything else. Party Kits are assembled Kits which are much easy to find once you have decided on your theme. PartyBell.com has huge collection of Party Kits for your Theme Parties. Party Kits are for those who want to have hassle free party planning. PartyBell.com has various Theme Party Kits for your needs. Disney Theme is one of the favorites among Kids and grown-ups alike. Be it Mickey Mouse or Minnie Mouse or Winnie the Pooh or Tangled they all are popular Birthday Party Theme Ideas. 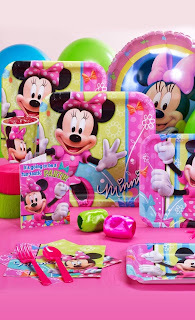 Celebrate your little Angel’s Birthday will our cute little Minnie Mouse 1st Birthday Standard Party Kit. Kit includes: 8 invitations, dinner plates, dessert plates, cups, forks, spoons, 16 napkins, solid-color table cover, foil balloon, 12 latex balloons (2 colors), curling ribbons (2 colors), crepe paper rolls (2 colors), and cake candles. Standard Pack for 16 includes: 16 invitations, dinner plates, dessert plates, cups, forks, spoons, 32 napkins, solid-color table cover, foil balloon, 12 latex balloons (2 colors), curling ribbons (2 colors), crepe paper rolls (2 colors), and cake candles. Availability: The colors/sizes are confirmed in stock & ready to ship! 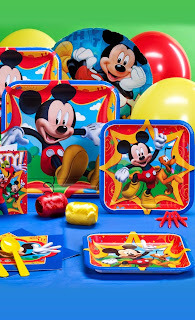 Let your little one have fun on his Birthday Party with this friends with this Disney Mickey Mouse Fun & Friends Party Kit. Material: Paper, plastic-LDPE, foil, latex, wax. Winnie the Pooh is one loveable bear! The “Silly-old Bear” ad described in the feature films is favorite Soft Toy among little boys & girls, which does make it one of the popular Kids Disney Birthday Party Theme Idea! 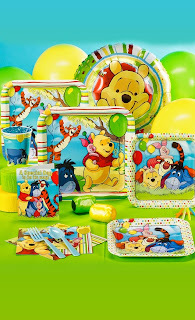 Celebrate your little girl or boy’s Birthday Party with Pooh and his Friends from the Forest. Description: Standard Pack for 8 includes: (8) invitations, dinner plates, dessert plates, cups, forks, spoons, (16) napkins, solid-color table cover, foil balloon, (12) balloons (2 colors), curling ribbon (2 colors), crepe paper rolls (2 colors), and cake candles. Standard Pack for 16 includes: (16) invitations, dinner plates, dessert plates, cups, forks, spoons, (32) napkins, solid-color table cover, foil balloon, (12) balloons (2 colors), curling ribbon (2 colors), and crepe paper rolls (2 colors), and cake candles. Passionate & fiery Merida is the latest popular Disney Character from Disney Animated movie – Brave. 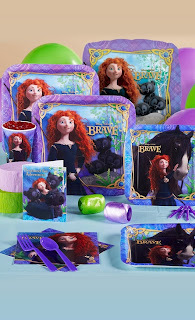 Celebrate your little warrior’s birthday with this Disney Brave Party Kit. Material: Paper, plastic-HDPE, plastic-PET, plastic-HIPS, latex, and wax. A hot-shot race car – McQueen zoomed into the hearts of many kids! 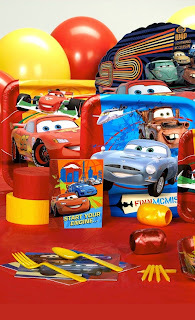 Have a speedy fiery celebration of your little one’s birthday with our Disney Cars Party Kits. Kits include: 8 invitations, dinner plates, dessert plates, cups, forks, spoons, 16 napkins, solid-color table cover, foil balloon, 12 latex balloons (2 colors), curling ribbons (2 colors), crepe paper rolls (2 colors), and cake candles. Standard Pack for 16 includes: 16 invitations, dinner plates, dessert plates, cups, forks, spoons, 32 napkins, solid-color table cover, foil balloon, 12 latex balloons (2 colors), curling ribbons (2 colors), crepe paper rolls (2 colors), and cake candles. Material: Paper, plastic, foil, latex, wax. 2003 Disney/pixar movie Nemo – story of cute little orange Clown Fish splashed its way to Kids Hearts. 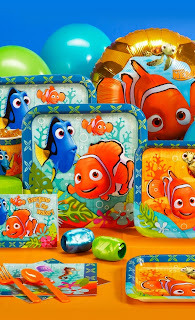 Get this Disney Nemo Coral Reef Party Kit for your Kids Birthday Party and take them to the journey with Nemo to the Coral Reef. Material: Paper, plastic-HDPE, plastic-PET, latex and wax. Little girls are enchanted by the world of castles, fairytale carriages, princes and princesses! 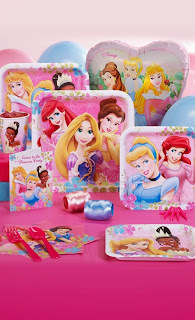 Give her perfect Birthday Treat with our range of Disney Princess Party Kits. Description: Standard Pack for 8 includes: (8) invitations, dinner plates, dessert plates, cups, forks, spoons, (16) napkins, solid-color table cover, foil balloon, (12) balloons (2 colors), curling ribbon (2 colors), crepe paper rolls (2 colors), and cake candles. Standard Pack for 16 includes: (16) invitations, dinner plates, dessert plates, cups, forks, spoons, (32) napkins, solid-color table cover, foil balloon, (12) balloons (2 colors), curling ribbon (2 colors), crepe paper rolls (2 colors), and cake candles. Pick your Kid's Favorite Disney Theme Party Kit and make his/her Birthday more special!